Learning how to keep warm is an existential problem we all have to face on our own. It takes many years to figure out what works. Being comfortable depends on listening to your own senses and experimenting with the available materials around you. Learning to be warm in a cold environment is at lot like learning to be happy in an inherently hostile world. You have to understand yourself and the forces around you and learn how to manipulate both to your advantage. In the beginning, our parents dressed us, but they could never get it quite right. Much of the time we were either too hot or too cold. They might insist, for example, that we wear warm clothing in circumstances where we were very active and generating a lot of heat on our own. As with other skills of self-maintenance, our parents might head us in the right direction, but they can't know exactly what is right for us because they aren't us! They don't have access to all the data we have. To be truly comfortable, you have to take control of your own fate and politely push away the advice of others. Likewise, marketers think they know what will keep us warm -- expensive jackets, sleeping bags or hokey hand warmers -- but of course they have a profit motive in selling us things we don't need. Keeping warm doesn't necessarily involve a lot of money. It requires wisdom about your own needs, knowledge of your environment and the willingness to plan ahead. Central heating is the lazy man's way to keep warm. If you live in a heated building (i.e. a "home") and you pump enough of active energy into the air, you can lounge around naked regardless of the temperature outside. This, however, is enormously wasteful, both in money and energy. The bigger the space you are living in, the more air and surface area you have to heat, and most of this energy usually comes from the burning of fossil fuels. In the winter in the north, you could end up spending almost as much on heating fuel as you do on rent or mortgage. Humans survived in harsh environments for thousands of years without central heating. How did they do it? They protected themselves with small shelters and wrapped lots of insulation around themselves, close to their body. Even in extreme environments like the arctic, their body heat alone was enough to keep them alive. How does this translate to the modern homeless lifestyle? You may need to find, build or rent a shelter when the climate requires it, but a very small one. The smaller you shelter is, the more easily your own body heat will keep it warm. 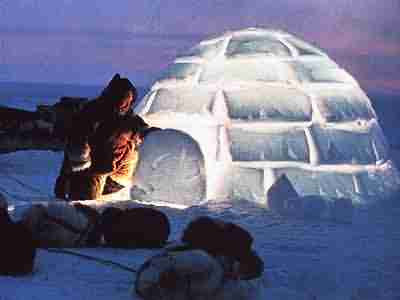 Then, within the shelter, you wrap yourself in insulation -- warm clothes and sleeping bags instead of fur and leather. You add as many layers as needed until you are toasty. There is no outside temperature you can't comfortably survive by this passive method, with no active heat source apart from your own body. Your needs for warmth are different during the day than they are at night. In the day, you are more physically active, generating more internal heat, and need only about half the insulation you require at night. The real challenge of keeping warm is doing it overnight, when you will be hibernating for seven hours. Everything has to be set up adequately before you begin or you won't get a good night's sleep. Keeping warm during the day is relatively straightforward: You dress in layers. When you are cold, you add more layers (like another sweater), and when you get hot, you remove some of them. Your own senses will tell you when to add or remove; you just have to listen to them. It may take some people years to catch on -- You have to dress warm to stay warm! -- but eventually they do. Keeping warm at night is much more of a challenge because ideally you want to be unconscious the whole time, which means you don't have the opportunity to add or remove layers. You want to have everything in place before you go to sleep, anticipating the conditions you will experience later at night. Since keeping warm while you sleep is a greater challenge than doing it in the daytime, the rest of this article will focus on that. You don't always need a shelter! If the weather is dry and insect-free (like in the desert), you don't need any shelter even down to temperatures as low as freezing. You can just sleep on a mattress out in the open! Significantly below freezing, you might want a tent for added warmth and protection from wind. In the rest of the world, thought, water is your main enemy. If snow or rain fall on your bedding, they could destroy its thermal value. Surrounding yourself in layers of insulation only works if it remains dry. Water is a heat sink! Many a miserable Boy Scout has learned the hard way that a wet sleeping bag is little better than no sleeping bag at all! That's the main purpose of a shelter: to keep you dry! A secondary benefit is cutting the wind, which also sweeps away your heat (although not as much as water does). If you are enclosed in a small shelter like a tent or car, your body heat can start working and warm up the space to something greater than the outside air. BTW: Caves are overrated as shelters. First of all you have to find one at just the place you happen to need it. Secondly, they tend to be very damp and drafty. The most you can expect from a cave is protection from the rain. If you go deep inside a cave, you might find the temperature becoming constant regardless of the weather outside, but what's the point of going to all that trouble when a car or tent can do just as well? Then you need a sleeping bag, which works much better than blankets. Probably the worst situation for keeping warm is the traditional, medieval-inspired, Martha Stewart-approved tucked-in bed (with sheets, blankets, bedspread, etc.). Under the covers, you have a relatively huge, ever-shifting space to heat! Your body heat is leaking out everywhere, and whenever you turn over, you come in contact with a new area of cold sheets. You don't have these problems with a zipped-up sleeping bag, which surrounds you on all sides and holds your heat in. Cheap sleeping bags work just as well as expensive ones, although you may have to use more of them. 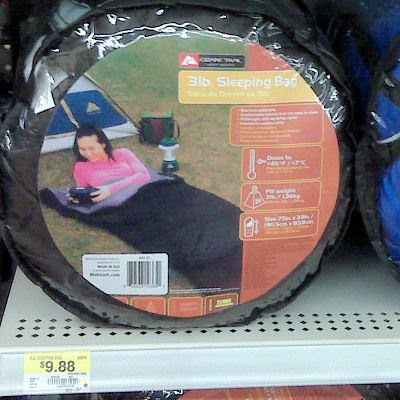 I am a fan of the 3-pound sleeping bag at Acme, currently selling for $9.88. On cold nights, I buy two of them, using them one inside the other. At this price, you can afford to throw them away when you change location or they start to stink. Helpful tip: Use a safety pin to hold the zipper of the sleeping bag in place it doesn't unzip on you over the course of the night. Some expensive sleeping bags have only two advantages that cheap ones: First, that can be lighter and more compact for the same insulation value. This is a a factor if you have to carry your sleeping bag on your back. Second, they are tapered at the foot of the bag rather than square. Tapered "mummy" bags give you only a small space for your feet to heat, while a cheaper bag with a square bottom has a big cavernous space down there that may lead to cold feet in the middle of the night. 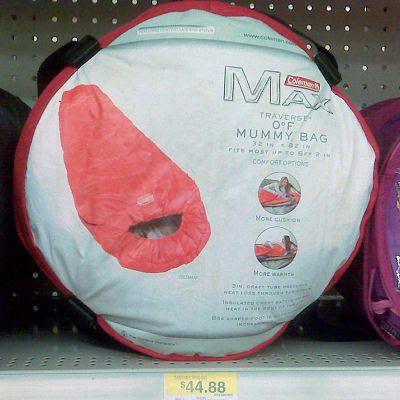 If you happen to have a mummy bag, you should use it as your inner sleeping bag with perhaps a cheap one outside that. The temperature ratings of sleeping bags (e.g. "20°F") are a fantasy of the manufacturer and are pretty much meaningless. You'll have to experiment with a sleeping bag yourself, in your own unique sheltering circumstances, before you know what it can do. In my experience, in temperatures below freezing you are usually going to need two sleeping bags, one inside the other. In temps below 0°F, I might even want a third sleeping bag to throw over me. With some planning, passive heating alone can get you through almost any weather scenario. I would resort to active heat sources only in special situations. For example, if I arrived in a new city without any bedding and no easy way to get it, I might rent a car, run the heater all night and sleep in the back. It works, often at a fraction of cost of a hotel! (Carbon monoxide isn't an issue, since the heater is forcing air into the car from the front.) In the past, I have used a propane-powered catalytic heater when sleeping in a van, but I don't recommend it, due to both cost and safety issues. Best just to add more bedding. If I am working on my computer in a car (like I am now, in frigid South Dakota), I might turn on the car occasionally and run the heater. The main reason for this is that my fingers are exposed as I use the keyboard. (I can't very well type with gloves on!) A little bit of active heat once an hour is just what I need to keep going. So in summary, you keep warm by sheltering yourself from falling water then surrounding yourself by as many layers of tight insulation as you need. Anyone can do it! However, there is another factor to consider: the psychological one. Have you noticed how some people are hyper-sensitive to the cold no matter how warmly they are dressed? It turns out ones attitude has a lot to do with keeping warm. I will discuss this at length in a separate entry. Oh, and there's one other method for keeping warm as the seasons change: Go someplace warm! It sounds self-evident, but one of the perks of the homeless lifestyle is to be able to go where life is most comfortable for you. You can survive in the frigid north if you need to, but its costly and painful no matter how you slice it. Take a tip from the birds if you can and fly south with the sun! Helpful article... thanks. I just have a bit of a problem with the disposable (landfill) sleeping bag routine. Can't the suckers be washed in a stream? if not, damn shame. Every resource issue is a balance. When you spend $10 for a sleeping bag, you might be using more resources to wash it than it is worth. These sleeping bags are made of 100% nylon/polyester, so it's not like you've killed a tree to make them. For the record, I don't usually throw these sleeping bags away. Instead, I roll them up, but them back in the original bag and leave them in a parking lot for someone else to discover. Hey man-- I'm in south dakota at the moment-- thanks for the post. Are you still around and able to hitch? South Dakota was just a pass-through for me. Go south, young man! Also, throwing away a sleeping bag after several nights use is surely much more "green" than several nights spent in a hotel with the temp set hot in cold weather or cold in hot weather, and several long hot showers, and disposable cups, and loads of towels, and so forth and so on. Your low carbon footprint cuts you massive slack on the disposal issue. I read all of your posts because I'm a living in my car too. You are amazing and your entries are well written, logical and VERY informative. I hope you turn this into a book or something. Not only have you taught me how to survive given my circumstances, but you have shown me that the "lean and simple" life is something to be proud about. Thanks for this blog. I mean it.